The Iranian rhetoric and actions do not match the image. Iranian leaders often make highly aggressive and belligerent statements, usually containing threats that sound far more hostile than the “moderate” face Iran presents to the West. However, once in a while, Tehran backtracks on its own rhetoric – rejecting the suggestion that it had intentionally spoken or acted aggressively, and denying that it still poses a threat. The latest subject of Iran’s backtracking is the ongoing saga of the tensions in the Persian Gulf, which have been rising exponentially in recent months with the arrest and humiliation of US sailors earlier this year, followed by a serious of dangerous naval altercations initiated by fast-moving Iranian Revolutionary Guards Corps (IRGC) vessels. While Iran has in the past boasted about its role in such altercations, threatening to take action against any Western “evil presence” near its territory, it is now making light of its latest confrontation with US Navy ships. 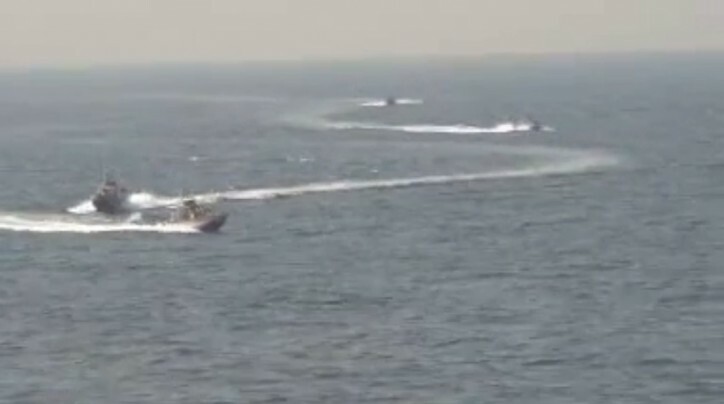 In a recent statement, a spokesman for Iran’s armed forces denied that Iranian vessels had closely approached and harassed the American ones during the incident, claiming that “the Islamic Republic’s vessels always act in full awareness” of international rules and norms – thus understating the risk of escalation at sea at Iran’s hands, as well as deflecting the blame by claiming the US had lied about the altercations. The Iranian statement was particularly farcical in light of the intentionally hostile steps taken by Iran to escalate the tension in the Persian Gulf, from unveiling a high-speed IRGC catamaran, to threatening to shoot down US surveillance planes with “Iranian missile” in international airspace, to sending seven fast attack boats to harass yet another US Navy ship. It was also at great odds with the description recently provided to Foreign Policy by Navy Lt. David Nartker of the January incident in which US sailors were held captive by Iran – a “harrowing confrontation” with Iranian ships equipped with machine guns, which erupted over a mere navigation mistake. Is Iran using the resonance of its statements in the media, both Iranian and Western, to downplay the active, hostile role it plays in such altercations? Let’s be realistic here. Would the US lie about an incident at sea in order to perpetuate a lie—— absolutely!!!!!! Anyone here old enough to remember the USS Turner Joy and the Gulf of Tonkin? Iran has plenty of reason to ditrust the US, not the least of which was during the First Gulf War the USS Vincennes shot down an Iranian passenger jet killing over 300 innocent civilians. The American capt received a medal for his “service.” I am as right wing as they come— but when it comes to the US lying—– damn straight we do—!